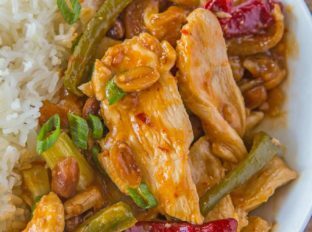 Skinny Kung Pao Chicken made in less than 30 minutes with chicken breast, bell peppers, peanuts and a slightly spicy garlic sauce. 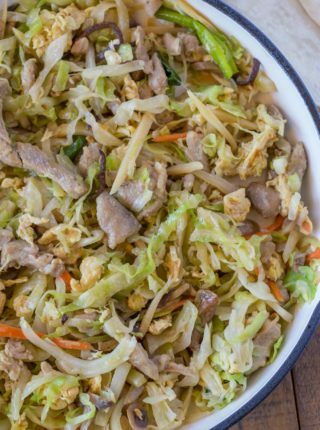 Chinese takeout doesn’t have to mean blowing through your weekly points. 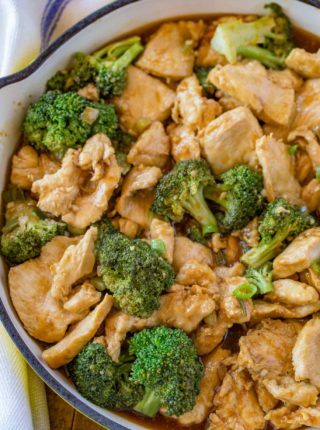 We love this Kung Pao Chicken, Beef and Broccoli and our favorite Skinny Sesame Chicken for takeout fake-out meals! 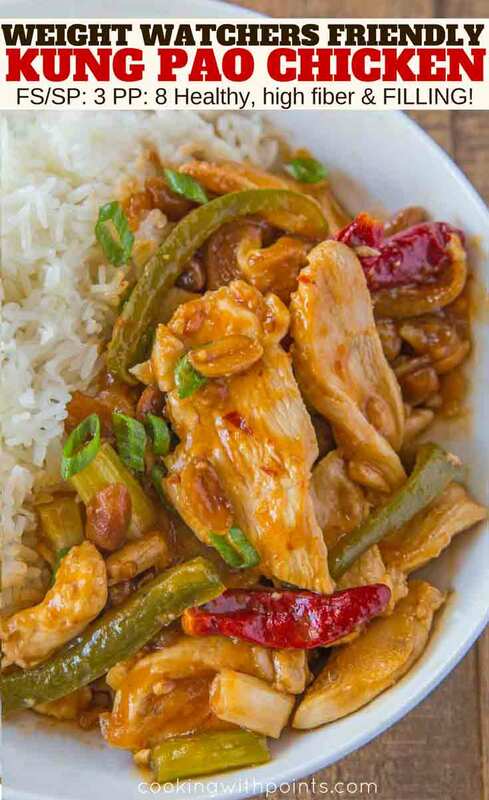 Lightened up Kung Pao Chicken is a fantastic dish that’s so healthy won’t believe all that flavor from the sauce and the crunch of the peanuts can be enjoyed on a diet! 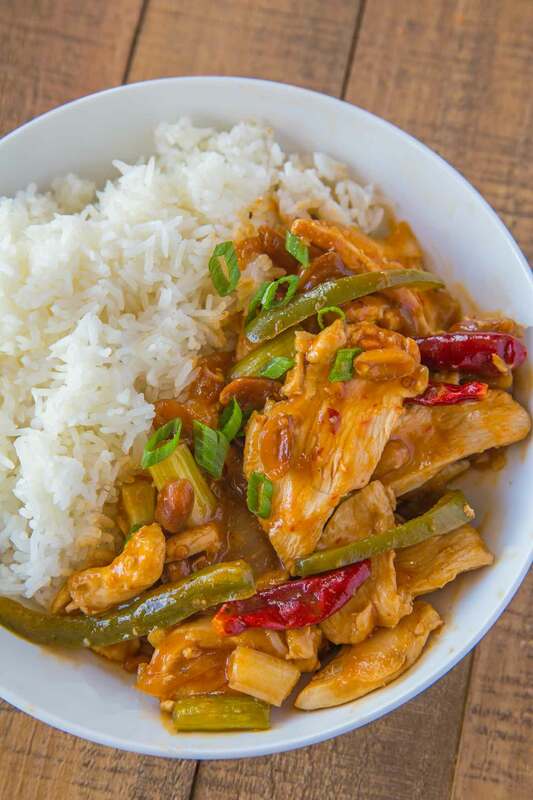 Kung Pao Chicken is one of our favorite take out options as it tends to be healthier than most Chinese restaurant options. 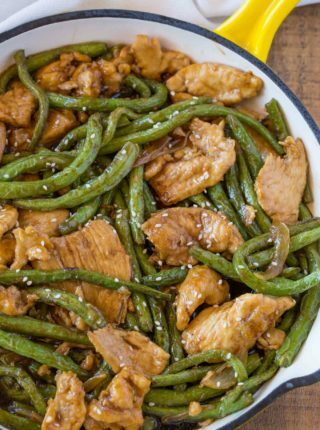 Most Chinese chicken options are deep fried, so this stir fry option doesn’t take a lot of work to lighten up while keeping the flavors! In fact even at Panda Express their kung pao chicken is less healthy than you might expect. To conserve oil, the chicken is cooked without being sliced first. To cut down on the peanuts we split them. Your mouth can’t taste the difference between the crunch of half the peanut vs the two halves still stuck together. We cut back on the brown sugar to just a teaspoon and swapped white meat chicken breasts for the chicken thighs. Sesame Oil: The flavor of sesame oil in this dish is unmistakeable and not really able to be substituted. Some Asian grocery stores will try and sell less expensive options that aren’t actually sesame oil, so just be sure the one you’re buying is authentic sesame oil. Add the canola oil to a heavy skillet on medium-high heat. Add the chicken and cook 5-7 minutes on each side, or until cooked through. Remove from the pan and add in the canola oil, garlic, ginger, red chili peppers, green bell peppers and green onions. Cook for 1 minute, stirring frequently. Add in the water, soy sauce, cornstarch and brown sugar and let the sauce thicken on medium heat. Cut the chicken breasts into thin slices and add it into the pan along with the peanuts. Toss together with the sauce and serve. These flavors sound amazing! Healthy?!?! Such a better option than take out! Love this healthier spin to one of my favorite take out items! Now, no guilt!! Love how quick and easy this comes together! 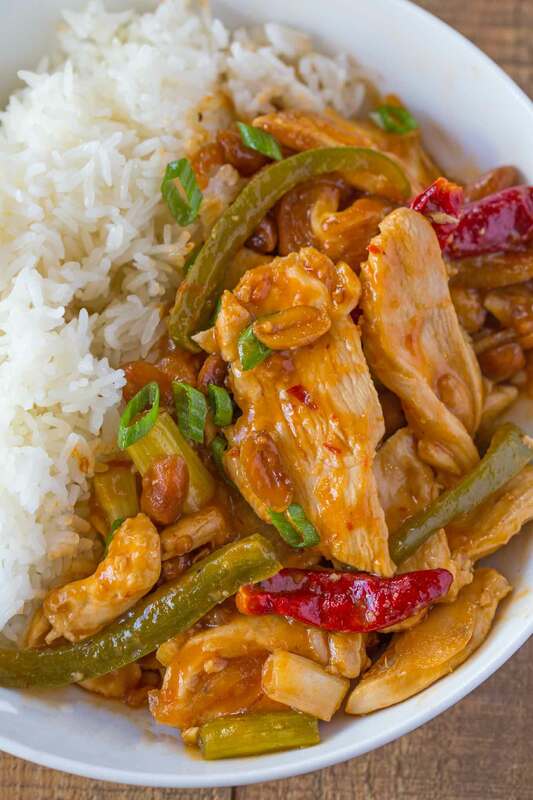 I absolutely LOVE Kung Pao Chicken!! And skinny!?? Can’t wait to try this one!! Thanks, Chrissie! Hope you like it! 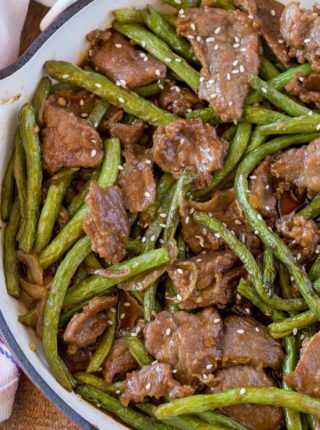 I can’t wait to try this healthy version of our favorite take-out dish!! Looks delicious and so easy to make! Such a great meal! Love this! Love the healthier take on it! Oh I love this! Looks like a great way to eat in!